Summary of today’s show: From his school days at the Archdiocesan Choir School as a child, Fr. Bill Kelly has heard the Lord calling him to the priesthood. He just never thought it would take such interesting turns. In his 20+ years as a priest, Fr. Bill has studied in Rome, received a doctorate in theology, taught at the seminary, led the ongoing formation and support of priests, been a pastor, and co-hosted a movie review show on CatholicTV. Fr. Bill joins Scot Landry and Fr. Chris O’Connor to talk about his vocation and his priesthood. 1st segment: Scot and Fr. Chris talked about the busy seminary schedule interviewing prospective seminarians for next year. Fr. Chris said this could be the largest class in years, with close to 25 new men applying. He said he’s going on vacation next week so he’s hoping to wrap up the process this week. Scot noted that early in Cardinal Seán’s tenure there was a total of 25 men at the seminary and there was talking about closing it. Now it’s filled to capacity with 79 men in residence. Fr. Chris said it’s the wisdom of the Church that men are brought together to be formed together. Today’s guest is Fr. Bill Kelly, who has served in the archdiocese as head of the office that deals with ongoing clergy formation, as well as teaching at the seminary. Now he’s pastor at St. Mary Parish in Dedham. 2nd segment: Scot and Fr. Chris welcome Fr. Bill Kelly. Fr. Chris recalled that Fr. Bill taught him how to drink wine in Rome. Fr. Bill said Fr. Chris didn’t have a lot of experience with wine. On the other hand, Fr. Bill was introduced to gin and tonic by Fr. Chris and his family. Fr. Bill grew up in Sacred Heart in North Quincy. He said his parents still live there. The pastor who was there for most of his life exuded the life of the priest. Sadly, he died suddenly in 1996 and a book of essays about this priest by his brother priests was produced and Fr. Bill uses that as an example of the life of the diocesan priest. He was a gentle soul and a tremendous preacher. At his funeral, there were 250 priests and 15 bishops. Six thousand people came to his wake. Out of Sacred Heart, they’ve had 7 or 8 men who’ve gone on to priesthood. Fr. Bill said he is the oldest of six, two brothers and three sisters. They are a very musical family. His dad is a drummer and his mother sings. His grandmother had a radio show on which she played piano. They grew up singing around the piano. Fr. Bill attended the Archdiocesan Choir School in Cambridge which elevated his natural interest in music and was the seedbed of his vocation. Fr. Chris said Seiji Ozawa once threw Fr. Bill out of Symphony Hall. Fr. Bill said he was a sixth grader in the choir in a rehearsal and was chitchatting a bit with a friend. Ozawa lost his temper and threw him out. Scot asked why the school was the seedbed of his vocation. Fr. Bill said the first time he thought of the priesthood was in the fourth grade and remembered the priest going to the tabernacle and being in awe of that. Later at the choir school, Ted Marier, the founder and original headmaster was not just a great musician, but Fr. Bill also believes he authentically a saint. The faith of the headmaster and his wife was expressed in the work they did. The choir sang at Mass every day and on Sunday. It was by his devotion to the Church that came pouring out of him through his musical genius. He remembers that the entire school was confirmed every four years, all the kids in the school and the Mariers were the sponsors of all the boys. It was during the singing of one hymn that the ides of a vocation came to him most clearly. Fr. Bill attended Boston College High School. While some of the Jesuits encouraged him to consider the order, he was very interested in diocesan priesthood. He went right into the college seminary, which he loved, not least because they didn’t have take any math courses. From there he went to the North American College in Rome for five years. When he left home, his youngest sister was in seventh grade and when came she was a senior in high school. He was home for three years and then returned for doctoral studies. His first assignment was Sacred Heart in East Boston for just three or four months. Then he went to St. Paul’s in Hingham. He went to Rome for a doctoral degree in dogma with the plan that he would come back to be spiritual director at the seminary. He was there from 1995 to 2005. Every seminarian has to have a spiritual director. They would meet every two weeks to help him grow in sensitivity and understanding to how God was at work in their lives. It always comes back to how it fits in with how it helps him discern whether God is asking him to be a priest. At the seminary, he had 15 to 25 directees. He also directed a number of religious sisters and laypeople. He also helped design the spiritual life component of the Masters of Arts in Ministry program. All told, he was seeing about 40 people per year in spiritual direction. Scot asked what it’s like to see many of the men he directed as priests now. Fr. Bill said it’s great to see them later. Fr. Chris was one of the seminarians at the time. He recalls finding Fr. Chris doing an impression of Fr. Bill giving a lecture. Fr. Bill said his priesthood was transformed by the students, seeing their love for the Lord and their priesthood. Fr. Bill said his closest friends in the presbyterate are men who were students when he was there. After St. John’s, he was put in charge of ongoing formation for priests. Fr. Bill said it was a natural transition in some ways. He did have to help priests of varying experiences from newly ordained to ordained for decades. It was just a few years after the abuse crisis began so there was a lot of need for providing support for the priests, including just having men come together. Fr. Bill said he is convinced the conversion of the priesthood will come through intellectual formation. Scot said one of the programs Fr. Bill brought to the archdiocese was Good Leaders, GoodShepherds from Catholic LEadership Institute. Fr. Bill said it’s a program that helps priests look at leadership skills, especially for priests feeling burdened by administrative tasks. It’s not just a time management course, but it truly was centered in the Church’s teachings. It weds the best practices of leadership in the corporate world with Church teaching. More than 100 priests in Boston have gone through the program. Scot asked what it was like to travel a lot around the country, speaking and giving retreats for priests. Fr. Bill said he enjoyed speaking to varied groups. He loved to bring communities together in a different way. He’s been fortunate in his life. He once lived with the great spiritual writer Henri Nouwen. He met Mother Teresa a number of times. He met Pope John Paul II and Cardinal Ratzinger. He’s been able to bring those experiences to his various talks. 3rd segment: Fr. Bill has been at St. Mary’s in Dedham for two years. He was a priest for 20 year before becoming a pastor. He’d been living at Holy Family in Rockland for 15 years, helping out on the weekends. He was happy to get the new assignment. It was a significant change. It’s phenomenal parish with wonderful leadership. Fr. Matt Williams and Fr. Bill Lohan were there as parochial vicars. Bishop Dooher was pastor there before becoming a bishop. Fr. Bill said their active youth group has a bunch of them in Nicaragua this week. Those who couldn’t go have committed to going to the 7am daily Mass to pray for those who went. Fr. Chris asked what makes St. Mary’s unique. Fr. Bill said it has a long and beautiful devotional tradition of care for the Blessed Sacrament. They have all-day/all-night adoration on Fridays. They have active prayer groups. The Mass is well attended and they have long and well-established music program. He remembers his first weekend singing with the choir. More recently, Life Teen is perhaps it’s most well-known program. Fr. Chris Hickey created this program from almost nothing. 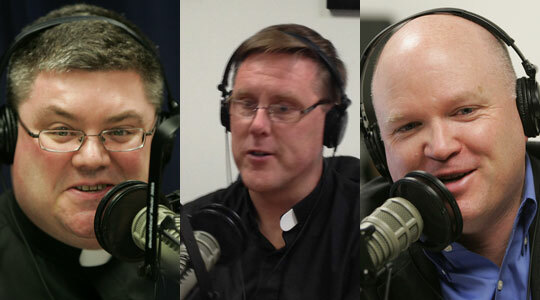 Five men with connections to St. Mary’s in the seminary with three more going next year. That’s the fruit of LifeTeen and of the prayer of the parish for vocations. They also have wonderful participation in the Sacrament of Confession. Fr. Bill said they renovated the confessional and made it very beautiful. It’s now a very large space with a great stained glass window. All the ancient traditional symbols of reconciliation have been incorporated into the confessional. They’re hoping to increase the amount of time devoted to confession and he said you can’t walk across the parking lot without being asked to hear a confession. It’s a spirit-filled parish. Fr. Bill said LIft Ministries was founded by two parishioners. Scot said he first heard about St. Mary’s because of the LifeTeen program. Scot said you don’t see many parishes that have all the generations so active in parish life. Fr. Bill said a priest friend visited last summer and on a Thursday night it was so busy that his friend asked him if he realized how lucky he is. Fr. Bill said at least six groups meet regularly on Thursday nights. Scot asked what the root causes of this active parish are in addition to good priests and prayer. Fr. Bill said it’s both the town of Dedham, which is the kind of place where people put down roots and always come home. It’s also the families. Because they don’t have a school, there is a little bit of a struggle to bring in young families, but they are seeing young families grow again and they are starting to see a growth of ethnic families in the area. Fr. Chris said each priest preaches one basic homily with variations. He asked what it is for Fr. Bill. He said because of his years as a spiritual director he thinks he’s mostly attuned to people’s friendship with Christ and their relationship with God. Then how does that get lived out. How is it that the Church is the surest way to grow in our relationship with Christ? The Church is the most abundant way that one’s spiritual life is able to grow. He said he thinks he needs to ramp up on some of the issues of the day in his preaching. Scot said Fr. Bill also co-hosts a show on CatholicTV called Spotlight along with Fr. Chip Hines. Fr. Bill said he and Fr. Chip were at some gathering for priests and got into a conversation about movies. They got into such an intense discussion that somebody told them they should have their own show. Somehow Fr. Bob Reed heard about it and asked them to do the show. They just finished their third year and have reviewed over 300 movies. They approach it from the point of view of whether it’s a good movie on a technical level, but also on what themes can be drawn from it on the basis of our Catholic faith. They will be upfront with people about the content if it’s morally objectionable. He said they often hear from cloistered nuns who watch movies based on their reviews. They take a currently running movie and build a theme on it, whether topic or theme or the like. He said the funny thing is when people come up to him at a wedding in the Communion line and look at him with recognition. For the summer, he recommends the quirky movie Moonrise Kingdom. He did just see the Spiderman movie and thought it was terrific. He does agree with critics who said the action scenes are not as exciting as in the other Spiderman movies. He’s very interested in seeing Woody Allen’s To Rome With Love. The biggest movie of the summer will be The Dark Knight Rises. He thinks the previous installment in the Batman series is one of the best movies ever. He said he knows some seminary professors use it in their moral theology classes. At the top of his list would be the Lord of the Rings trilogy; the Wizard of Oz; Ordinary People because he loves family dramas and because it’s when he fell in love with the movies. Scot asked Fr. Bill where he would recommend people look for family-appropriate movies. He said the Boston Globe has a family-friendly guide or search online. Fr. Bill said the old DIsney movies are great for kids. For children’s movies, don’t take them to the dumbed down movies. There are good movies with good messages and substantial messages. He recommended The Secret World of Arrietty.